The Responsive Classroom approach to teaching is comprised of a set of well-designed practices intended to create safe, joyful, and engaging classroom and school communities. The emphasis is on helping students develop their academic, social, and emotional skills in a learning environment that is developmentally responsive to their strengths and needs. In order to be successful in and out of school, students need to learn a set of social and emotional competencies—cooperation, assertiveness, responsibility, empathy, and self-control—and a set of academic competencies—academic mindset, perseverance, learning strategies, and academic behaviors. How we work together as adults to cre­ate a safe, joyful, and inclusive school environment is as important as our individual contribution or competence. What we know and believe about our students—individually, culturally, developmentally—informs our expec­tations, reactions, and attitudes about those students. Partnering with families—knowing them and valuing their contributions—is as important as knowing the children we teach. Responsive Classroom is an approach to teaching based on the belief that integrating academic and social-emotional skills creates an environment where students can do their best learning. The Responsive Classroom approach consists of a set of practices and strategies that build academic and social-emotional competencies. This approach works well with many other programs and can be introduced gradually into a teacher’s practice. Interactive Modeling—An explicit practice for teaching procedures and routines (such as those for entering and exiting the room) as well as academic and social skills (such as engaging with the text or giving and accepting feedback). Teacher Language—The intentional use of language to enable students to engage in their learning and develop the academic, social, and emotional skills they need to be successful in and out of school. Logical Consequences—A non-punitive response to misbehavior that allows teachers to set clear limits and students to fix and learn from their mistakes while maintaining their dignity. Interactive Learning Structures—Purposeful activities that give students opportunities to engage with content in active (hands-on) and interactive (social) ways. Morning Meeting—Everyone in the classroom gathers in a circle for twenty to thirty minutes at the beginning of each school day and proceeds through four sequential components: greeting, sharing, group activity, and morning message. Establishing Rules—Teacher and students work together to name individual goals for the year and establish rules that will help everyone reach those goals. 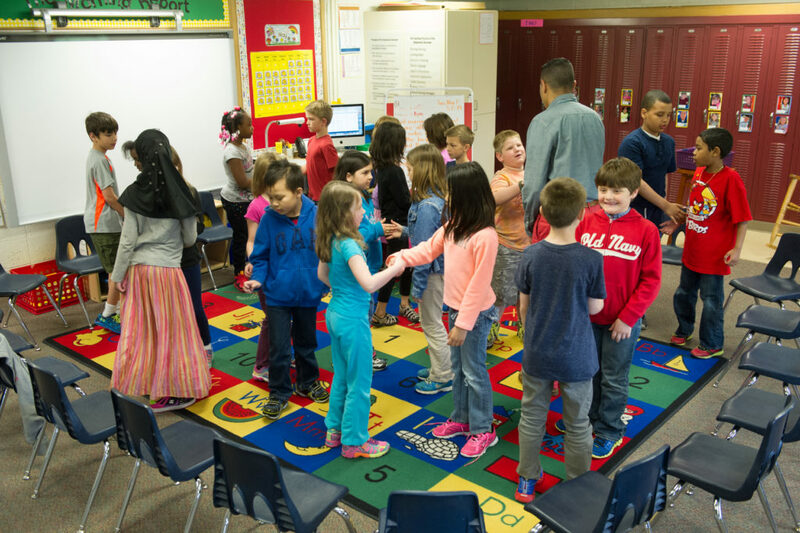 Energizers—Short, playful, whole-group activities that are used as breaks in lessons. Quiet Time—A brief, purposeful and relaxed time of transition that takes place after lunch and recess, before the rest of the school day continues. Closing Circle—A five- to ten-minute gathering at the end of the day that promotes reflection and celebration through participation in a brief activity or two. Responsive Advisory Meeting—A practice with a set, predictable routine, organized around one of seven distinct purposes, that offers a solid framework for building meaningful connections and developing respectful and trusting relationships while meeting students’ developmental needs. The meetings have four sequential components: arrival welcome, announcements, acknowledgments, and activity. Investing Students in the Rules—A process facilitated by the teacher that is composed of four steps: setting SMART goals, connecting the goals to rules, connecting the rules to concrete behaviors, and making the rules come alive. Brain Breaks—Short breaks in whole-class lessons that give students a chance to move and interact, used to increase focus, motivation, learning, and memory. Active Teaching—A strategy for delivering curriculum content where the teacher presents, explains, illustrates, and demonstrates content in a way that enables students to meet a learning objective. The three phases of active teaching are Teach and Model, Student Collaboration, and Facilitate Reflection. Student Practice—A process that follows active teaching where students explore and practice, under the teacher’s guidance, the content and skills taught during a lesson. This gives the teacher the opportunity to identify and correct students’ thinking before they practice further on their own. is organized by the teacher.